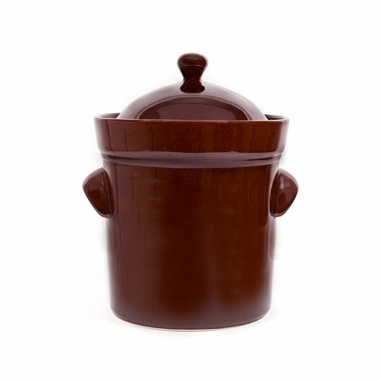 Hand crafted with the rich, abundant clay by the largest ceramic manufacturer in the Boleslawiec Region of Poland, the Boleslawiec Crock is crafted by those with over 60 years of experience. Perfect for preserving vegetables using lactic fermentation. Easy to use compared to traditional methods. Complete pot includes base, cover, weighing stones and instructions. 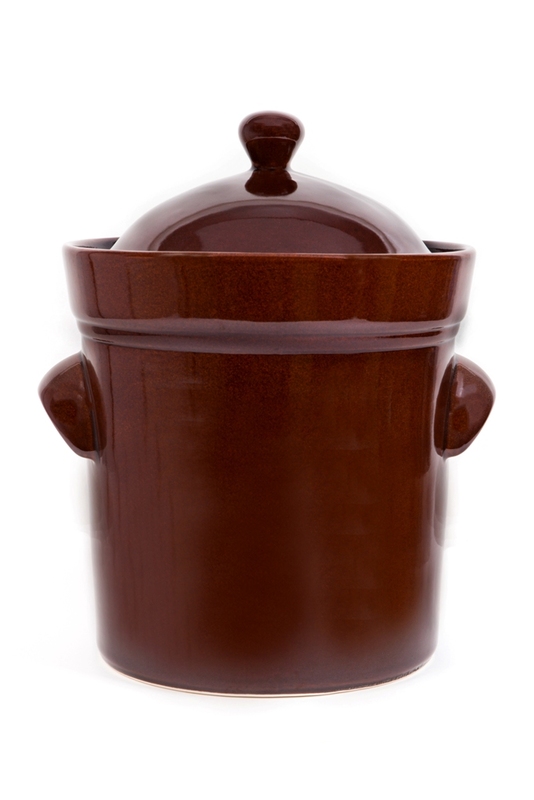 Sauerkraut or pickled cucumbers prepared in this 10 Liter stoneware pot are indispensable sources of vitamins. Vegetables stored in airtight crock pots such as the ME2110 10 Liter Crock pot have proven to be one of the best possible ways to maintain the vegetables flavor and fresh aroma. Contrary to foods pasteurized in preserve jars, food items stored in stoneware containers lose none of their nutritional value. By placing a lid onto the water-filled flange of the pot, air is prevented from entering inside the pot. Vegetables in the pot undergo the process of fermentation, releasing carbon dioxide which gradually displaces the air completely. In this way, anaerobic atmosphere is created inside the pot. Preserves maturing in these unique conditions acquire an unforgettable flavor. With the help of a stone weight, included with this pot, the vegetables are kept below the surface of the juice filling the pot. To create an airtight seal, add water to the flange and top it off about once a week. In addition, to reduce water evaporation from the flange, you may add a few drops of vegetable oil to the water so that it will not need replenishment as frequently. Product was exactly as described, and already in use. My wife is very please with it. The crock arrived ahead of schedule and well packaged. It's very handsome, and I can't wait to put it to good use. This is a wonderful crock, can't wait to have the first fermented sauerkraut from it, it is soon ready. The shipping time was very fast, and the transaction was perfect. Thank you! I love my ferrmentaion Crock! It is absolutly lovely! This brand I purchased, the Polish pot it is wide enough to be able to reach in and place in and take out the weights with ease, and has teh walls build wide enough ....I love love this product!!!! The kimchi was excellent now on to the sauerkraut! After years of careful preparation and babysitting of our sauerkraut in our old fermentation crock, and failing to get a good result 1/3 of the time, we finally studied up on a good alternative crock. We are so glad we did! The design is almost fool-proof, the product was very well protected for shipping, and we are almost ready to eat our first batch of kraut. Would we recommend this to others? Absolutely. Already made red kraut, started the green kraut. Love the crock! Exactly the pot I was looking for, especially with the water seal. Produced a great crock full of sauerkraut. This was a trial run and look forward to another batch this summer.